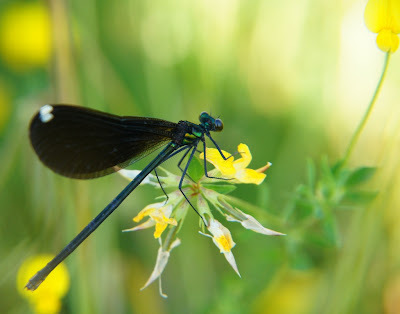 I was SO excited to photograph this Ebony Jewelwing, because not only had I never photographed an Ebony Jewelwing before, I had never photographed ANY species of Jewelwing. So, I chased the bug through the tall grass and wildflowers, dismissing the thought of ticks, which kept coming into mind. I HAD to get a photograph! Had.To. Well, I got a couple photographs (after several minutes of chasing), and when I returned back home, I excitedly put the photographs on my computer to view... only to realize that I didn't get the wings in focus. My heart sank. I had never seen a Jewelwing around here before, and I have doubts if I will again. So, I just chalked it up to a missed opportunity and was thankful that I did, in fact, at least photograph a new-to-me species. However... when scrolling through photos on my computer today, this photograph struck me in a whole new way. I kept going back to look at it. I was viewing it in a different way than how I usually view my "bug photos". Rather than looking at it as a "photo of a bug" which needs to have all details in focus, I saw the overall photo... the soft and whispy background... the yellows and greens... the yellow flower to the right of the image and the fact that it looks like the Jewelwing is appreciating that flower's beauty. Then, magically, a photo which I had at first been very disappointed in, became a whole new photo to me when I looked at it in a different perspective. So... I now share it with you to see what you think. You could look for digital tuner on sale, or you could join in on Macro Monday. I suggest you click on the badge and have fun! Well, there you go. I thought it was beautiful at first glance, and didn't change my mind after reading that you thought the wings were out of focus. I love this photo! It's beautiful, from any perspective! It's a wonderful photo and I'm glad you gave it a second look! Oh my...I don't know if I could have braved ticks to get such a photo. Wonderful job! I can just see you chasing him through the weeds!...great capture!! 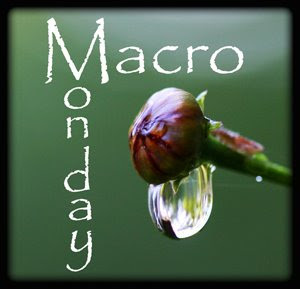 Have a great Macro Monday! !